Every Sunday morning, for about 15 minutes, I am highly entertained by 98-year-old (she will be 99 in early May) Margaret Suddereth. I pick her up for Sunday School at her high-rise apartment building on Peachtree Street, and she regales me with stories of our church, Peachtree Road United Methodist, where she has been a member since 1943. Margaret is responsible for the garden you see above, which was originally conceived as a memorial to a minister's wife who died. Apparently, the garden had languished over a period of years until Margaret, who is a go-getter and driving force behind fund-raising for many of the buildings at our church, took over the garden in the 1970's. "We've had every landscape architect in Atlanta out here trying to get it right," she said. "It's been nothing but trial and error. We've planted and then taken out I don't know how many times." The garden has some disadvantages. One, it is enclosed on all sides by buildings, making air circulation a problem. Secondly, it's sunny and hot in most areas and shady in others, so watering requirements are different. Margaret says that at one point, dogwoods (a symbol for our church is a dogwood blossom) were planted, but they performed poorly. What did do well, however, were foster hollies, which got out of hand and eventually reached 25 feet in height. No one could keep up with the pruning, and so they were cut down (I remember thinking this was a bad idea; I loved them). The decision was finally made to create an all green and white garden. Thus, some pink George Tabor azaleas were removed and replaced with 'White Empress' camellias (you can see their dark foliage up against the far wall). The dogwoods were replaced with 'Natchez' crepe myrtles, and despite the poor air circulation, the latter have actually thrived. On the sides, someone had planted 'Otto Luyken' laurels, which were spindly at best. The dark green leaves looked like they'd been shot with bullets, there were so many holes. Those were replaced with gardenias, which have yet to get white fly (I'm crossing my fingers). The gardenias are special, because they are named for a nephew of our long-time fomer minister Don Harp. Still, those vigorous bushes must be pruned after they bloom each year, but they do perfume the garden in June. All sorts of ground covers have been tried, but dwarf mondo, pachysandra and ajuga have survived. Other successful shrubs are Osmanthus fragens, the tea olive. I love walking through when they're in bloom. What you can't see is a raised semi-circle with a statue of St. Francis. Margaret says this was originally a pool, but smokers would throw their cigarette butts in the water, and "it looked like a floating ash tray." The hurdle now to overcome is the state of the American and English boxwoods. They need good drainage and regular watering, so they've had problems. I've suggested trying Korean boxwoods. I feel they can withstand the extremes and grow well in planters and in the ground. Even now, Margaret directs what should be done. 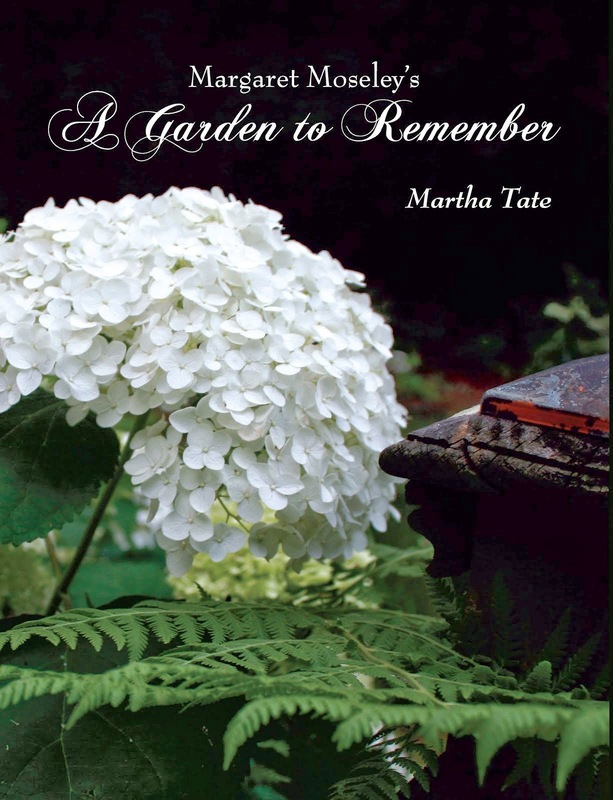 She can name every plant that's ever been in the garden, even the various annuals that have been tried over the years. Margaret is one of those people who won't tolerate it when something doesn't work. She's ruthless. If a plant languishes, it's removed. "With gardening, you just have to keep trying until you get it right." I think she has a great point. Oh my, the arrogance of planting what we want. I remember thinking Jane Bath was a bore. Ha, now know she is EXCITING. No worries. Told her years ago. How many decades would I NOT use mondo? Pure arrogance. Stupidity? What a wonderful reminder to keep at it! Sometimes one gets discouraged when something doesn't work, but if she can keep at it after umpteen years gardening then the rest of us certainly can too! I'm still a novice gardener, but I find this inspiring. Thank you for sharing.